PERDIX (Programmed Eulerian Routing for DNA Designs using X-overs) is a free, open-source resource for the fully autonomous design of arbitrary 2D scaffolded DNA origami nanostructures. DNA can be programmed to robustly self-assemble into pre-defined nanoscale structures of nearly arbitrary 2D and 3D shape using the principle of scaffolded DNA origami, invented by Dr. Paul Rothemund in 2006. 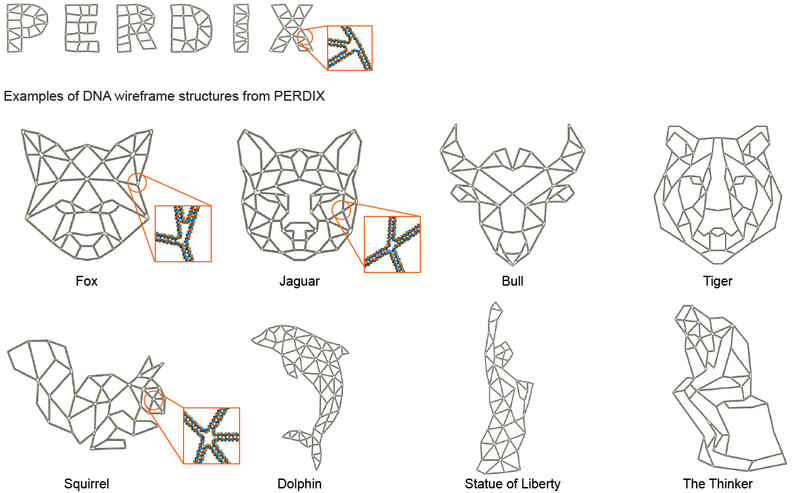 This website offers a free online portal to the PERDIX design software that automatically converts any 2D polygonal mesh file specified using simple Computer-Aided Design (CAD) into the synthetic DNA sequences needed to synthesize the target object. In short, PERDIX offers the ability to “print” your 2D nanometer-scale geometry using DNA. For more information on our approach, please see this accompanying article by Jun et al., Science Advances, 2019 and the About page.